On a narrow path in one of Dar es Salaam’s unplanned settlements, a man sits on a wooden stool. His feet are planted squarely on top his flip-flops, a cooler and a few styrofoam cups are scattered nearby. In his mouth he holds one end of a rubber tube; the other end, a glass vial, is poised just above his shin. For the better part of the night, he will wait, his headlamp fixed on his legs, catching mosquitoes as they land on his legs attempting to feed. The Human Landing Catch (HLC) was one of several techniques deployed by the city’s Urban Malaria Control Program (UMCP) to measure the density of mosquito populations throughout Dar es Salaam. From 2004 to 2009, neighborhood volunteers known as Community-Owned Resource Persons, or corps, were recruited to attract and collect mosquitoes during their peak biting hours (sunset to sunrise) at a number of select locations across the city. 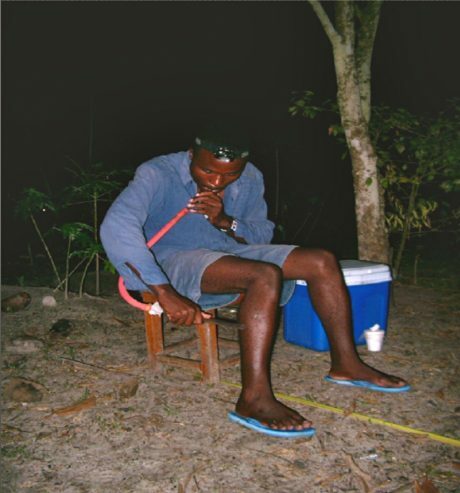 Compensated at a daily rate of three thousand Tanzanian Shillings (roughly $2.45), these participants were asked to catch mosquitoes for forty-five minutes every hour (allowing fifteen minutes to organize samples and annotate a collection log) throughout the night. Because mosquitoes were caught while seeking a blood meal, the HLC not only served as an index for vector density, but also as a parameter for malaria transmission rates. This and other researches conducted under the auspices of the UMCP sought to develop tactics of control attuned to the specific malarial dynamics of the city (Chaki et al. 2012). The Human Landing Catch seems the stuff of imperial nightmares—global health researchers using Africans as bait (c.f. White, 1995). However, in practice, the problems with the method are perhaps more mundane. Free prophylactic treatment, regular screenings for parasites, and access to health care counter the dangers of pathogenic exposure. The real drawback of the method, according to its practitioners, is its tiresome and monotonous nature. The HLC requires focus, skill and above all stamina. But while grueling and difficult to supervise, the HLC remains a central entomological technique to estimate the size and nature of insect-borne public health threats. In the context of the UMCP, it offered a practical solution to the problem of how to monitor a residual and highly distributed vector-population. To understand the method’s empirical capacity, I would like to suspend the heady ethical and biopolitical questions the HLC raises, and first ask: How does the catcher’s body relate to the task of measurement? In public health, the body is the definitive indicator: Its surfaces, structure, and biochemistry anticipate epidemics and locate environmental risks. The epidemiological significance of the HLC is different. Here, the human does not form part of a sample, but is rather used as a snare. The human trap is without complex mechanism or architecture; but its composition is nevertheless structured by the dialectics of predator-prey (c.f. Lévi-Strauss, 1966: 50). The material setting and set-up—back-alley, nightfall, bare legs, ankles and feet—enact an archetypical moment of man-vector contact. The fixity of the human form-aspirator in human, cups and cotton wool in hand-transforms that scenario into a means of capture. His body acts as lure, apparatus, cage and inscription device; it is an epistemic thing, providing a “surface on which apparatus and objects make contact” (Rheinberger, 2010: 217). This take on the HLC may seem grandiose; as an experimental set up it seems on a par with swatting flies. However, if we consider the HLC as one of several devices used to elucidate mosquito dispositions and preferences, the subtleties of the method become clear. The HLC belongs to a family of devices that aim to model vector dynamics through a workable format and material versatility. Another classic example is the experimental hut—artificial homes where entomologists can model the vicissitudes of mosquito flight and indoors feeding (Kelly, 2012). While attempting to simulate natural conditions (traditional architecture, thatch walls, human sleepers) these experimental replicas of the domestic realm are structurally modified to render mosquito behaviors visible—window traps, light apertures and modular walls enable researchers to monitor and manipulate flight patterns, trenches and raised platforms keep out scavengers who might remove dead or dying mosquitoes before they can be collected. 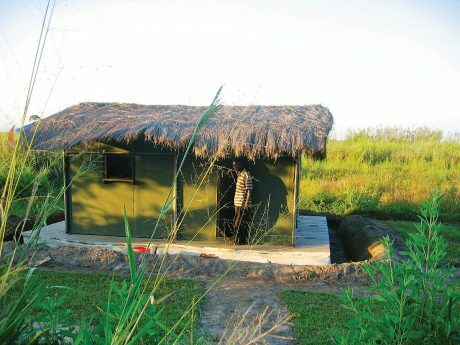 Experimental huts, like the Human Landing Catch, reflect the behavior of prey and model the intentions of the hunter; they are, in this sense, a ‘lethal parody of the animal’s Umwelt’ (Gell, 1998: 27). In the experimental hut too, the body is multiply configured by the experiment: The sleepers attract, catch and graphically trace the trajectory of the mosquito as it intersects with human hosts. In the experimental hut, that movement is domestic; the reciprocal exchange of parasites from mosquito to human happens within the home (Kelly, 2012). The HLC elaborates a different vectoral space: In response to years of interventions aimed at the home—indoor residual spray, household screening, ceiling boards, insecticide-treated nets—mosquitoes in Dar es Salaam are increasingly likely to feed outdoors. In fact, this behavioral shift of Anopheles Gambiae, its growing ability to seek human blood in the streets, was the central justification for undertaking the UMCP. Malaria risk can no longer be mapped onto a discrete intra-domiciliary space; it is distributed within, and heightened by, the vicissitudes of urban ecology—the built environment, the circuits along which water and waste circulate, the daily trajectories of permanent and transient inhabitants (c.f. Mitchell, 2002:19–54). Because mosquitos can breed in almost any body of water, malaria hot-spots can appear suddenly and anywhere—a clogged drain, a pile of tires, a newly tended garden. Reducing malaria transmission thus requires a spatially extensive and temporally intensive monitoring platform capable of tracking vector-populations as they surface and disperse in the city. The HLC provides that necessary investigative intimacy. 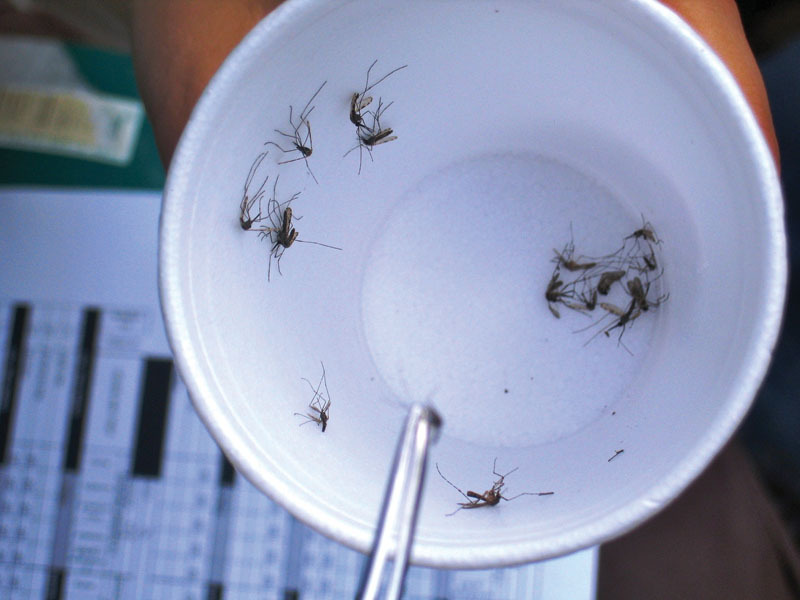 Residents transformed into sentinels, the corps’ rapt attention extended the UMCPs gaze to the minute depressions, fissures, and tiny accumulations were mosquitoes proliferate. Fixed in their chairs from sunrise to sunset, the corps anticipates an approach to malaria control that is quite literally, situated. Chaki, Prosper P. et al. 2012. “An affordable, quality-assured community-based system for high resolution entomological surveillance of vector mosquitoes that reflects human malaria infection risk patterns” Malaria Journal, 11:172, May 24. doi:10.1186/1478-4491-921. Gell, Alfred. 1996. “Vogel’s net: traps as artworks and artworks as traps.” Journal of Material Culture 1(1):15-38. Kelly, Ann H. 2012. The Experimental Hut: Hospitable Vectors. Journal of the Royal Anthropology Institute, 8 (1S):145-160. Lévi-Strauss, Claude. 1966. The Savage Mind. Chicago: Chicago University Press. Mitchell, Timothy. 2002. Rule of Experts: Egypt, TechnoPolitics, and Modernity. Berkeley: University of California Press. Rheinberger, Hans Jorg. 2010. An Epistemology of the Concrete: Twentieth Century Histories of Life. Durham & London: Duke University Press. White, Louise. 1995. “Tsetse Visions: Narratives of Blood and Bugs in Colonial Northern Rhodesia, 1931–9.” The Journal of African History, 36(2):219-245.